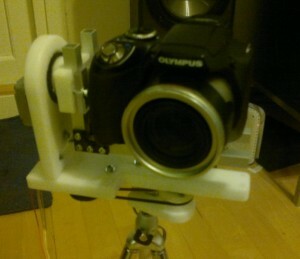 The panorama robot is a motorized camera stand for shooting panoramas automatically. Although the software available for making panoramas out of individual images are nowadays quite good, precisely taken photos make the compilation easier. Some types of panoramas, like spherical ones, are very difficult to shoot without any equipment, which was the reason I built this device. From my the previous projects, I had some mechanical parts and raw material left over. As I am moving soon, I decided to use them within this project, instead of hauling them to the other side of the country or throwing them away. This robot is not finished yet. More pictures of it, as well as the software, will be uploaded here as I have time to finish the device. The frame of the panorama robot is made of thick polyacetal plastic or Delrin. As I had a chunk of the material left over, I decided to use it to this project. Polyacetal is one of the easiest materials to machine with a good surface finish. The parts were made using a normal flat-headed end mill and finished using a small circular edge routing bit. 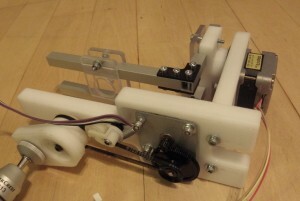 The parts were designed to house two stepper motors with their reduction gears. The bigger one is from an old flatbed scanner and it ended up on a tilting mechanism. The smaller one, complete with a belt drive, is from my all-in-one printer that gave up a ghost. Stepper motors are driven using two ready-made stepper driver boards that are left from my 3D printer project. They are attached to an Arduino Duemilanove with a self-made “interface board”. It was machined from an old leftover piece of copper-clad FR4 board. The Arduino was from the Drone. When I had my worst crash ever with the Drone an year ago, the Arduino was damaged quite badly. The processor socket and the headers were shattered. The processor pins were torn off. But after a little soldering and with a new AVR processor, it could be used. 12 volt lithium batteries that power my model aircraft, are used as a power supply. The software for the robot was written from scratch. I wanted to control the device over a Bluetooth link with various devices, with no specific software requirements. So I wrote the firmware of the robot to offer an ANSI terminal compatible user interface, that can be used with a PC with terminal software, or for example, with my N900 smartphone using its terminal. The robot first asks in degrees, how wide panorama is needed, with how much overlap. Then I have to enter exposure time for each shot, which after the device does its thing automatically, takes a photo using selected exposure time and positions itself ready for the next shot. The software, schematics and board image will be released as an open source when I get them finished!